Containers are removable for maximum versatility--lunch Bento Box closes tightly over containers even without lids. Bentology’s Portion Control Container Kit comes with a frosty translucent outer container, 5 translucent inner containers, and 3 teal colored leak-proof lids. Each container is sized to help you pack the right amount of lean proteins, whole grains, vegetables, fruits, and healthy fats. Also included is a 20-page Portion Perfect Weight-Loss Plan booklet that has 2 weeks of meal plans, shopping lists, recipes, workout routines, and tips to keep you motivated. No more weighing foods and counting calories! 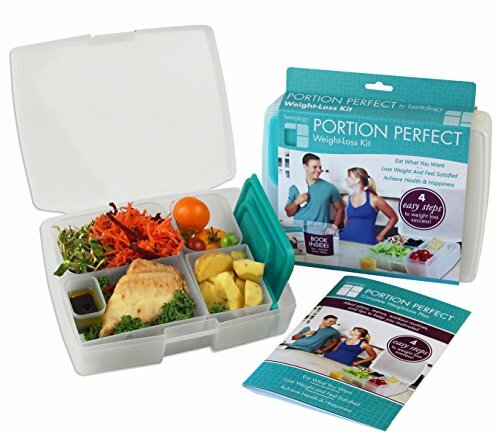 This easy-to-follow Portion Control Container Kit is perfect for meal-prep, and all kinds of on-the-go-meals and snacks! The containers are versatile and compact–easy to carry around and easy to store. Stack them up in the refrigerator or store them neatly in the cupboard when not in use. They are durable, reusable and easy to clean: the sets are dishwasher safe (all components, top rack only – no heat boosters) and microwave safe (containers, not lids). Bentology makes having a healthy on-the-go meal easy! Perfect for kids and adults. Made in the USA / Includes 1 year manufacturer’s guarantee from date of purchase / Lunch containers are food safe: contains no lead, bpa (bisphenol a), phthalates, or pvc.